The holy day of obligation, Ascension Thursday, will be celebrated on Wednesday evening at 6:45 p.m. and on Thursday at 6:45 p.m. The second of two Ancient Healing Services this month will be celebrated on Wednesday, May 23 at 7 pm. We pray that all the visitors (from Zionsville & Bloomington) who came to the May 9th healing service continue to trust in the Word of God for the blessings bestowed upon them. Names & petitions were collected. We will be offering thanksgiving to God on their behalf in upcoming services. ByzanTEEN Mission Trip – The Eparchy of Parma is partnering with YouthWorks to sponsor a mission trip to Logan County, West Virginia for those ages 13-18. The trip will start on Saturday, July 28 at the Cathedral of St. John the Baptist in Parma, OH and return there on Sunday August 5, 2012. 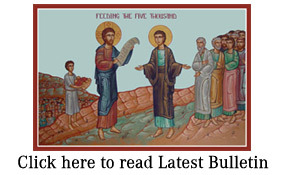 Download application materials at www.byzcathculturalcenter.org. Serve our Lord thru serving others. Happy Mother’s Day to all women of the parish. You truly deserve glorious accolades for all you do. Happy birthday to Fr. Sid who thanked God for his 84 years this past Tuesday! May they all have a wonderful day receiving God’s blessings and graces. The rectory heating system will need to be repaired this year. Of course there’s time until fall weather hits. We need your help (prayers, donations, fund raising labor) to have the work done in a few months. The farmers markets are now opening. This is where we sell our Eastern European bake goods and it’s also a great way to evangelize. There are two markets on Saturday morning this week. Next week a third market is being added on Tuesday afternoons. Please contact the rectory to volunteer at these important fund raisers. The parish needs the income for various projects. Thanks. Please note that the baking this week is on Wednesday so the feast of the Ascension can be celebrated without performing undue work on the holy day. If you haven’t been able to help the baking efforts on Thursdays this may be your chance. Check your schedule and call the rectory if you can volunteer to help with making our delicious bake goods on Wednesday, May 16th.